Speaker Anthony Calfo gave a good review of the WMC in this Reef Central post: "Kudos to the committee and the attendees that made this conference truly a success! As one that has attended and helped to plan my share of such, I can honestly say it was a very fine job for your first (re-annual ) big event. It was a yeoman's chore that the committee pulled to coordinate a 3-day event with so many participants... and it appeared to run so very smoothly. I am certain if/when you hold WMC again you will be rewarded with even greater success. The other regional clubs/folks especially that missed this event truly missed a good time and really should not miss the next time around. It is so important that we show support for each other (sister societies) in the pursuit of our information gathering/sharing. The late night chat sessions with wise and wiley folks like that inimitable Bob Fenner are just icing on the cake." 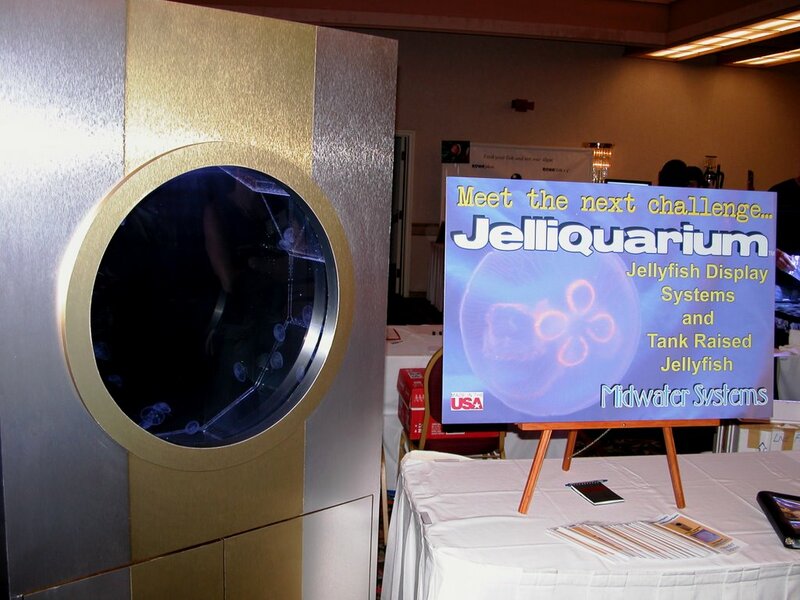 Jelliquarium Jim Stime of Thousand Oaks, CA has found a creative niche in today's aquarium-keeping hobby with the introduction of his Jellyfish aquariums. The "midwater zone", the area of the ocean that no longer uses daylight to photosynthesize, contains the majority of the ocean's life and is where some of the most interesting animal life can be found. Jellyfish, which mainly live in this zone, are made up of 99% water and are found all over the world, in every ocean and even in freshwater. Jellyfish collection is a difficult task and permits are limited. Jelliquarium not only sells the systems that are required to keep these animals alive, but also provide the tank raised animal. 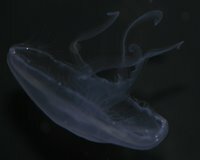 The Jelliquarium, also known as a plankton Kreisel, is uniquely designed. Water flow is introduced by a method called laminar flow. This creates a gentle flow that keeps the jellyfish in suspension. This flat stream of water acts as a boundary against the edges of the tank and creates a water flow that helps to separate debris in a manner as to not draw the jellies into the filter system and to maintain the gelatinous organisms in suspension. FragFarmer.com and YourReef.com Eric Caamano, left, of Frag Farmer dot com, (909)931-7977, made the trip from Southern California to take a break from the day to day business and relax with friends and colleagues. 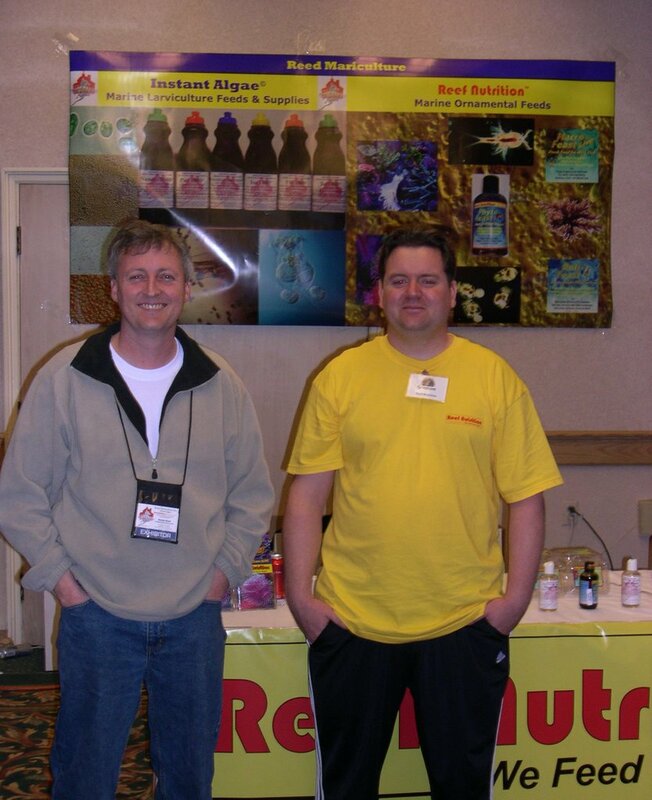 After years of working out of his home, John Daakan, right, of Roseville, recently opened Your Reef, (916)786-3474, his retail store to supplement his on line sales. 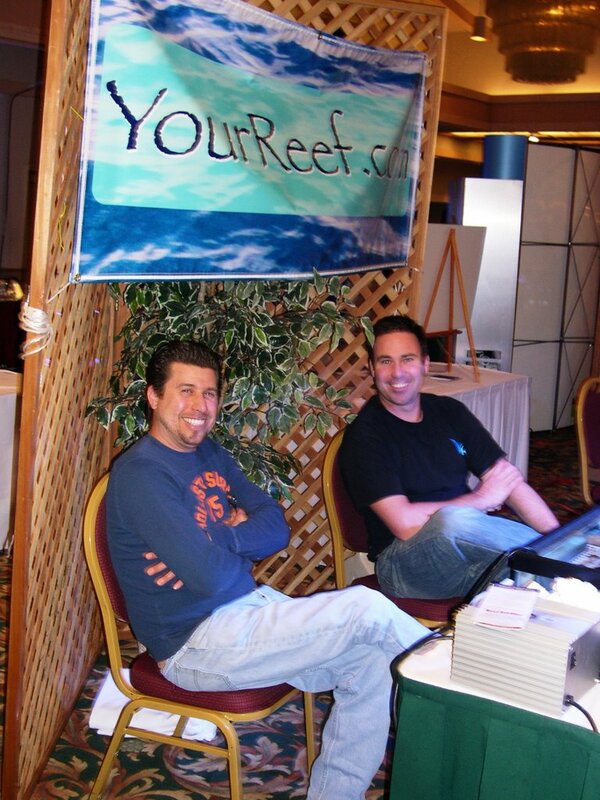 These gentlemen undoubtedly sell some of the best corals in the United States and also donated a good number to the WMC raffle. 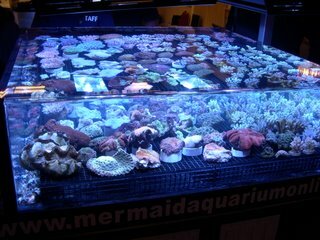 Max of Mermaid Aquarium from Fremont set up a very cool seamless aquarium full of Tonga SPS colonies, clams and LPS corals. Mermaid also donated the grand prize to the WMC raffle, a $3000 retail value 100 gallon aquarium with a cherry stand and canopy. My client Debbie from Truckee was the fortunate winner! Reef Nutrition The talk around Randy, left, and Gresham's booth was all about their new product, so new it doesn't have a name and it has not yet been packaged. The product is super cool little red algae puffs for tang feeding. Whether they label it Tangy Treats, Tang Feast, or Tribbles, it is a hot product that will keep your herbivores fat and happy. 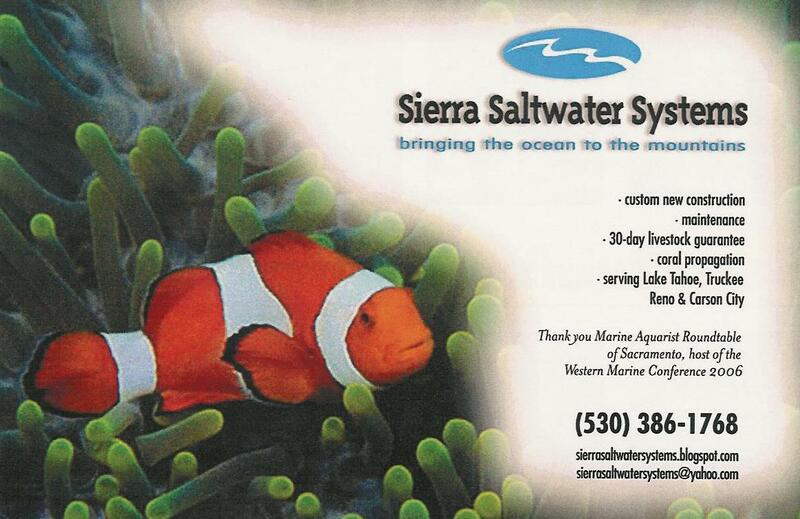 A copy of Sierra Saltwater System's ad created by Shelley Fallon, Fallon Multi Media, Kings Beach, (530)546-9393, that ran the in conference program. Additional vendors attending the conference were CPR, Sunlight Supply, Coral Reef EcoSystems, Piscine Energetics, Reef Frontiers, Coral Magazine, Fishbowl Innovations, Tropical Reef Oasis, Walt Smith, Liquid Life, Reefs.org, Pacific Garden Supply, Catalina Aquarium, ROWA USA, SeaChem Labs, CaribSea, and DT's Plankton Farms. Donators included, Clams Direct, Dainichi, Innovative Lighting Solutions, Island Marine Tropicals, Ocean Nutrition and TruVu. With just three weeks to go until the Western Marine Conference, I am really looking forward to the weekend of April 21-23. The WMC has been on hiatus for the last five years. I and nine other members of the Marine Aquarist Roundtable of Sacramento have been working extremely hard for the past year and a half organizing what will undoubtly be the best marine aquatic conference this side of the Mississippi. With weekly meetings we have gathered some of the best speakers in the industry from Hawaii to Pennsylvania: Eric Borneman, Anthony Calfo, David Cripe, Bob Fenner, Sanjay Joshi, Scott Michaels, Mike Paletta, Adelaide Rhodes, Steve Robinson, Walt Smith, Leng Sy, and Rob Toonen. The marine vendor marketplace boasts over two dozen exhibitors who will be displaying their goods. Some vendors plan to premiere new products at the show. The giant raffle features a 130 gallon aquarium with stand and canopy, plus smaller aquariums, over 50 coral colonies, a ton of frags, a variety of light fixtures, skimmers, pumps, and lots of dry goods. Everyone who buys raffle tickets should be going home with something! If you are serious about your aquarium, the $130 investment will be the best you ever made. A few of my clients plan to attend. The last day to register online is April 15. Walk up registration is available.